Standard says; Jaws strong with a perfect, regular and complete scissor bite i.e. 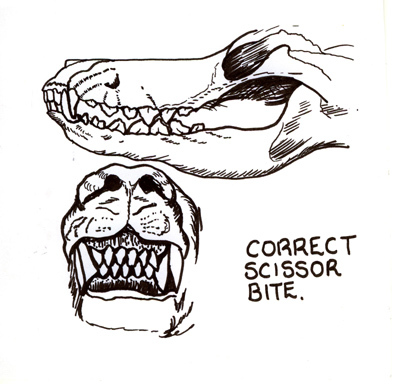 upper teeth closely overlapping lower teeth and set square to the jaws. Although we do not get many problems with bad mouths in Deerhounds it can occur. As the Deerhound gene pool is small this is going to happen from time to time. Our experience is, like the woolly coat, it is often the best in the litter. some law beginning with S comes to mind. You can however find a puppy with a slight overshot mouth will come right. Who said breeding dogs was easy eh!